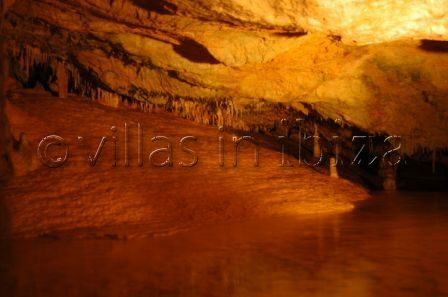 Cova De Can Marcá is located in Puerto De San Miguel and is open all year round. The cave is thought to be over 100,000 years old and was originally discovered by smugglers. The original entrance was around 8 meters above the sea and used to hide away goods. Even today you can still see red and black markings that the smugglers made in order to point the way to the exits for a quick getaway. The tour of the caves costs 8,5€ for adults and 4,5€ for children (5 to 12 years old) and lasts approximately half an hour. You are taken around by a tour guide who explains the history of the caves, in English, Spanish and German. The tours run every 30 minutes and the caves are easy to find as they are well signposted once you reach San Miguel.